Now Here’s An Executive Order That Makes Sense | What Would The Founders Think? Nope, it doesn’t compromise the national sovereignty of the United States. Nope, it doesn’t undermine existing legislation. Neither does it legislate by fiat, that which Congress has declined to do. It doesn’t even expand government authority. Maybe the reason it doesn’t do all these things is because this executive order didn’t come from the man who would be king. Instead it was issued by Arizona’s common-sense, down-to-earth governor, Jan Brewer. 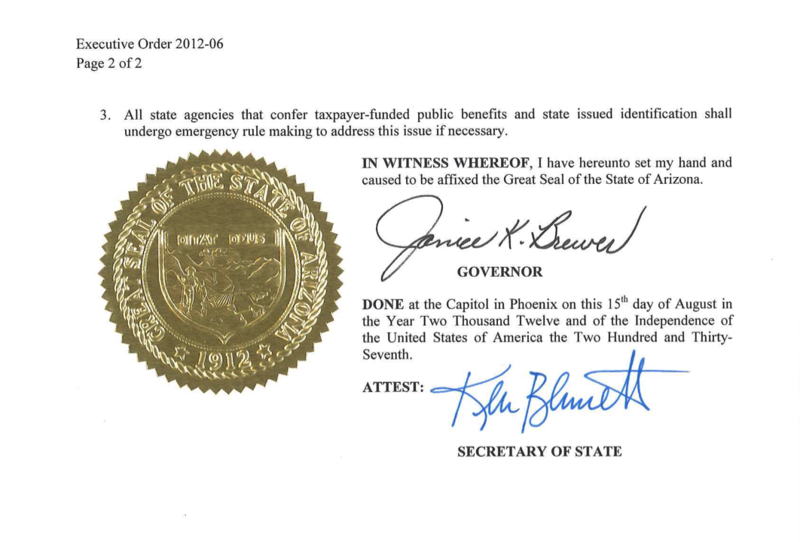 Arizona’s governor doesn’t often issue these – only about 6 this year. So, what does this executive order pertain to? Well, it’s pretty clear. Governor Brewer means to keep the state solvent. Toward that end, she has issued a clarification to state agencies – taxpayer-funded services will not be provided to people who are not in the state legally, regardless of whatever quasi-status Mr. Obama has decreed. Such clarification is eminently reasonable and helpful in light of the confusing state of affairs with regard to the faux-dream act/political pandering of Mr. Obama. Arizona voters have made it abundantly clear that they don’t want their tax dollars going to support law breakers. 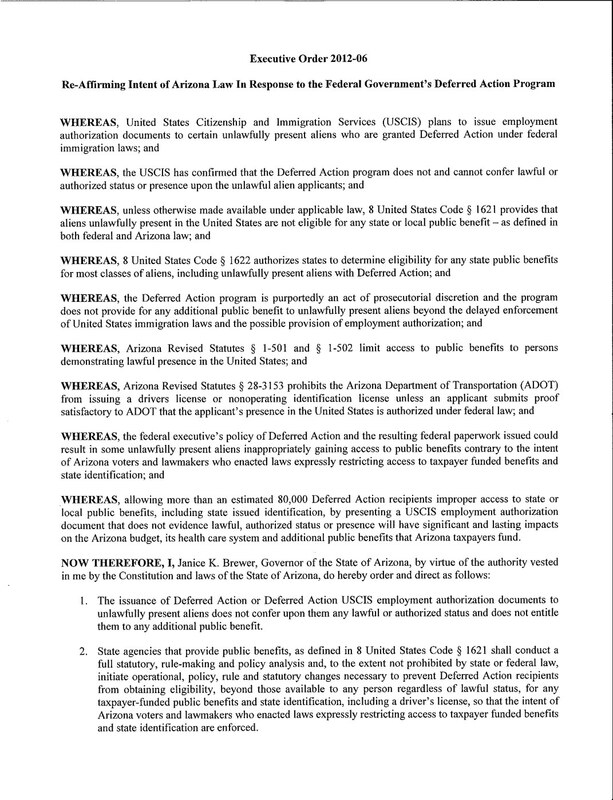 They voted overwhelmingly in support of a proposition that stopped the ridiculous practice of granting in-state tuition to illegal aliens, they don’t want drivers licenses (with which you can vote) issued to non-citizens, and they don’t like providing AHCCS (Arizona Health Care Cost Containment System – Arizona’s Medicaid Agency) to people that are not here legally.) According to an AZDHS report, in 2009, Arizona taxpayers ponied up somewhere between $30,000,000-$70,000,000 to pay for thousands of illegal immigrants to give birth in Arizona hospitals. * And that is just for babies. Governor Brewer isn’t motivated by hate – she is just being responsible to the citizens of Arizona. Arizona has the 6th largest population of illegal immigrants in the country. Arizona hospitals spend millions of dollars annually on illegals’ care. Some rural hospitals have had to downscale or close. Illegal aliens cost the state millions in lost tax revenue, burden infrastructure and are responsible for much of the violent crime in Arizona. This is insanity and Governor Brewer and the majority of Arizonans (and Americans in general) recognize it. That seems like a pretty convenient way of ignoring the facts – don’t differentiate between legal and illegal immigrants. You can bet that the majority of these women were not here legally. I wish all states would adopt a similar executive order. This is just good policy in my opinion. Our tax dollars are already be redistributed to people living off the system who are citizens and legal. Why should they be redistributed to those who are not here legally. She’s trying to make Arizona an unattractive place for illegals and I applaud her for it. I appreciate knowing this. I too wish all states would follow suit.